Four years ago, my husband and I were operating a rural, homestay bed and breakfast in the heart of the wine region of Lane County, Oregon. While we thoroughly enjoyed hosting guests and cooking for them as well as listening to their travel adventures, our travels had come to a screeching halt. 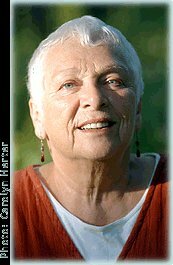 It was during this season of our lives that our daughter introduced me to Rita Golden Gelman’s first book, Tales of a Female Nomad – Living at Large in the World. When ever I could find a little personal down-time between biding farewell to current guests and greeting our next guests, from my cushy armchair with feet propped up on the ottoman in our “Gathering Room”, I vicariously traveled with Rita on her journey around the world, depending on her intuition, trust and serendipity… experiencing adventure after adventure as she connected with people in faraway places I’ve never been. It took me a month, but eventually I finished the book, only wishing there were more stories to read to satiate my hunger for travel. “Timing is everything”, so the saying goes. Now, in the midst of selling our home along with nearly all our personal possessions and plans to live aboard a sailboat, Rita has published a new anthology/cookbook Female Nomad and Friends, Breaking Free and Breaking Bread Around the World. Between showing our home and working on projects, once again I sat in that same chair and immersed myself in Female Nomad and Friends. 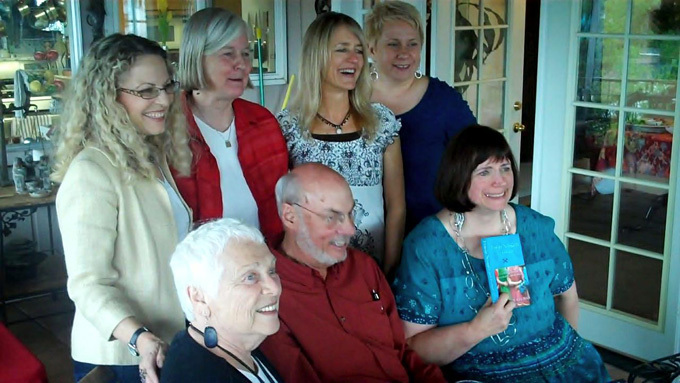 This time reading aloud to my husband, both of us laughing and crying and celebrating as we read the eclectic mix of travel adventures and recipes shared by Rita and forty other contributing authors from around the world… with our future travel adventures now within reach. Here is an excerpt from How Female Nomad & Friends Came to Be and What It’s All About by Rita Golden Gelman, Female Nomad and Friends. “It was not planned; it kind of snuck up on me when I wasn’t looking. E-mail was the vehicle. 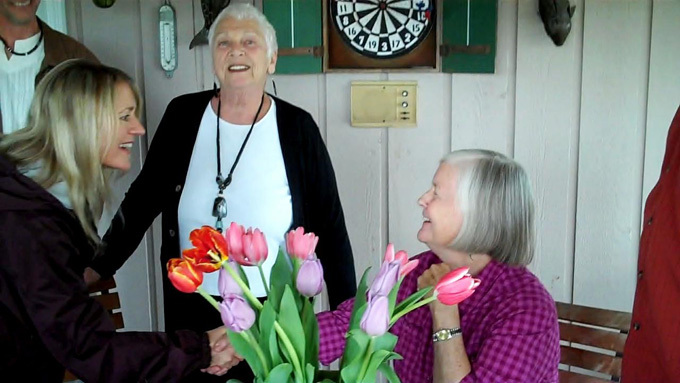 Rita’s universal truths about connecting with others, besides being friendly and smiling a lot, includes “food is the universal connector”, which is the reason she invited submissions for her new anthology/cookbook. Her invitation evolved into an amazing collection of fifty-nine fascinating and entertaining travel adventures from forty-one authors and thirty-three taste-tested and author-approved international recipes. Some of the common threads, besides friendship and food, which seem to travel in some form from story to story in Female Nomad and Friends is that in order to experience life at its fullest, we will find new and exciting experiences and adventure when we stray from the well-traveled path, learn to overcome our fear of the unknown and take risks, trusting that new acquaintances, even complete strangers, will help us, feed us, teach us and receive from us whatever we have to give. Also, great things can come from what initially appears to be far less-than-desirable circumstances. 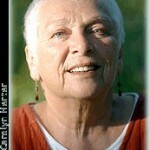 For twenty-three years, Rita has lived a nomadic life with no permanent address. Over the years she has made friends wherever she has wandered as well as with those who read her books and connect with her via email and website found on page 303 of Tales of a Female Nomad (which was contrary to the publisher’s advice). I am one such reader. Rita and I communicated back and forth a few times, and most recently, due to our connection, I have become one of her friends who volunteer to assist her with miscellaneous tasks involving her non-profit Let’s Get Global promoting the “gap year movement” in America, and her Female Nomad and Friends Global Dinner Party. 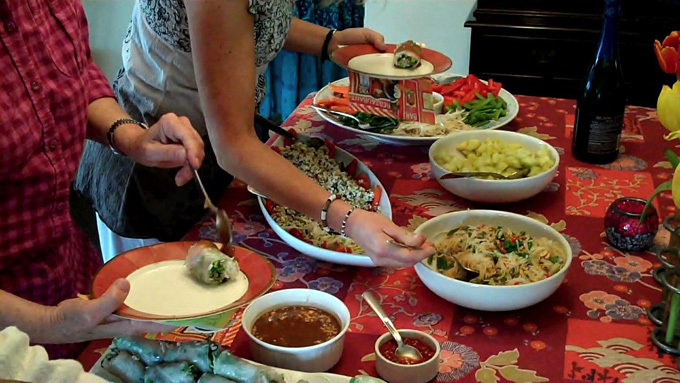 The global dinner party is happening this week “Connecting Through Food”- on Friday, June 18th anytime between 4:00pm and 11:00pm. You’re all invited! All you have to do to participate is to host a dinner party at your home and invite family and friends, while others are doing the same thing, the same night, all over the world. Your guests’ ticket to the party is to order or bring a copy of the book (all royalties go to send kids living in the slums of New Delhi to vocational school) and to bring a dish using one of the recipes from Female Nomad and Friends, or a personal favorite. 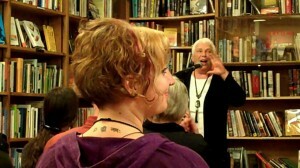 For more information, go to Rita’s Facebook fan page “Female Nomad” or her Rita Golden Gelman – Female Nomad website. 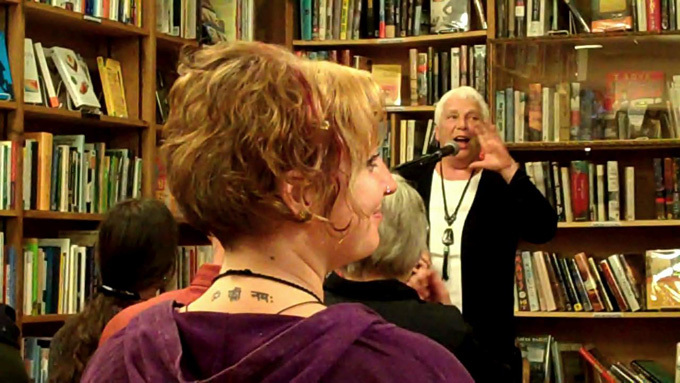 Rita Golden Gelman with Female Nomad and Friends authors Bonnie Betts and Sally Brown meeting for the first time at the launch party in Seattle, Wa. Female Nomad & Friends, Breaking Free and Breaking Bread Around the World was launched June 1st and celebrated with Rita and some of the contributing authors and friends in Seattle at her daughter’s home, Jan Gelman (also a contributing author), followed by an authors’ reading and book signing at Ravenna Third Place books later that evening. 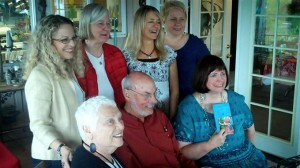 Jan, Sally, Bonnie, Asa, Rita, Tim and Pat posing with a copy of Female Nomad and Friends. Although friends communicating by phone and email, I had the great pleasure of finally meeting Rita in person and connecting with her and others through food as we celebrated the launch of Female Nomad and Friends. 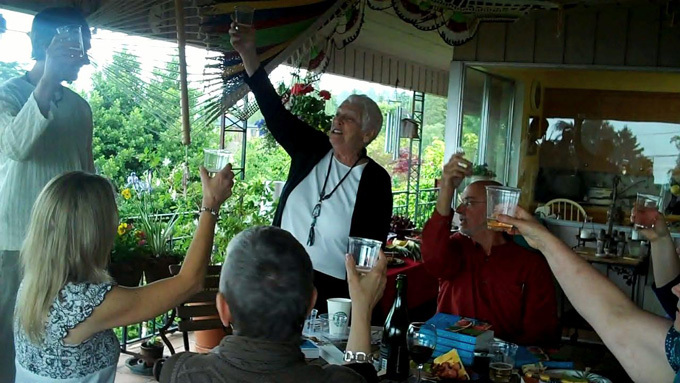 Rita and friends take turns making toasts. 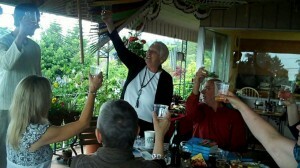 Rita toasts to the scholarship funds raised by 100% of the royalties from the sale of Female Nomad and Friends. We toasted to the book sales’ royalties that will continue to provide scholarships for high school graduates growing up in the slums of New Delhi to receive further education and learn a trade at the vocational school. Already more than $40,000 has been sent to the New Delhi Rotary Club, who is vetting and mentoring the scholarship recipients! 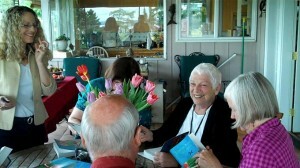 Jan, Pat (hidden behind bouquet), Tim (back of head), Rita and Sally signing each other’s books. Female Nomad and Friends by Rita Golden Gelman with Maria Altobelli and iIlustrated by Jean Allen, copyright © 2010. Published by Three Rivers Press/Crown Publishers, a division of Random House, Inc. BUY IT HERE. Arriving in Seattle a day before the launch party, Rita invited me to go shopping with her at the Vietnamese market, located in Seattle’s Chinatown International District, for a variety of Asian ingredients, introducing me to various basils, produce and condiments that were unfamiliar to me… like Bumbu Pecel, a peanut instant salad dressing that comes in a block that you shave and add water to thin. I bought some of their sweet, floral tasting mangosteen and lychee for the party. 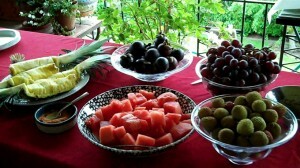 Fruits include mangosteen and lychee. By the time we had checked off everything from the shopping list, we were both quite hungry. Rita introduced me to her favorite Vietnamese restaurant nearby. I took her travel advice to heart about food – “eat everything you are offered.” Although I am a pescetarian (seafood-vegetarian), I wanted Rita to freely introduce me to some of her favorite Vietnamese dishes at the Tamarind Tree, without any of my dietary restrictions. What an amazing menu! We shared a savory, crispy Vietnamese crepe filled with prawns and squid and beansprouts, squid stuffed with ground pork, and eggplant satay. This was definitely the best Vietnamese food I have ever eaten. Thanks again, Rita! Back at Jan’s we prepped and cooked food for the following day, as we continued talking. Sally Brown, one of the contributing authors (Connecting to Raymond on page 41), who drove four days (all the way from Minnesota) to attend the gathering, arrived just in time to help with preparations. We washed, sliced, squeezed, chopped and cooked as we chatted and told stories. Rita’s Larb Gai (ground chicken) is really, really good! See page 71 of Female Nomads and Friends. 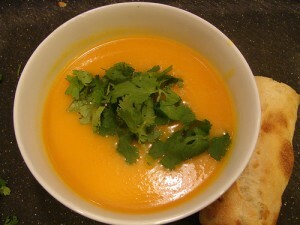 Here is a delicious Curried Carrot Soup recipe from Female Nomad and Friends (page 109), shared with permission by Rita Golden Gelman (more recipes posted for the Female Nomad and Friends Global Dinner Party on the Facebook Female Nomad fan page: 5 Female Nomad Friends Recipes. SautÃ© onion in butter for five minutes. Add carrot slices, curry powder, chicken stock, and water. Simmer until carrots are soft. Add salt and pepper and adjust for taste. Serve with fresh dill, mint, and sour cream. I’m always sorry I didn’t make more. There’s never enough left over. Next time I’m going to double the recipe. I pass the herbs and sour cream at the table in separate little dishes. Some powdered chicken stock is quite salty. Check ahead of time. The caldo de pollo I use in Mexico often substitutes for salt. I use less than 2 tablespoons powder and add no additional salt. At one of the tastings, Jean (our illustrator) made a batch of applesauce and set it out with the herbs and sour cream. People put big dollops of the applesauce in the soup. The curry and the applesauce provide a very different but wonderful taste. Do I have favorite Female Nomad and Friend stories? I love them one and all for different reasons. But, yes, I do have more than a few that readily come to mind, probably because I’ve already reread them a couple of times – Chapati Love Remembered, Train to Tithorea, Riding Out the Storm, The Perfect Seatmate, Connecting to Raymond, A Boat Ride… and then there’s… oh, I do love them all! 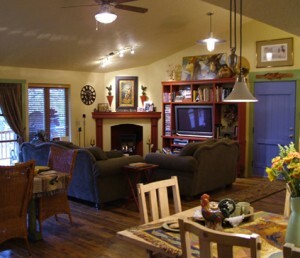 We invite you to join us on the Female Nomad and Friends Virtual Tour. From June 7 through July 2 you can return daily to click on the link to other scheduled Female Nomad and Friends book reviews throughout the month, to read what others are saying about Rita and friends’ new anthology! You can learn much more about Rita and how you can host a Global Dinner Party at your home via her Female Nomad website. 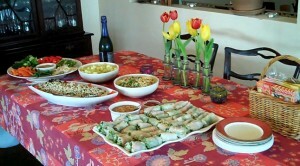 Reposted from my cooking blog Cook Around the Block. 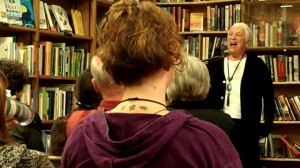 Female Nomad and Friends, Tales of Breaking Free and Breaking Bread Around the World… Here’s a Taste! Here is a pre-launch “taste” of Rita Golden Gelman’s new anthology Female Nomad and Friends, Tales of Breaking Free and Breaking Bread Around the World. Following the excerpted text from her book, buy buttons are provided so you can pre-order a copy of her book prior to it’s release date of June 1st. By ordering copies of Rita’s latest book, a portion of her royalties from the sale of Female Nomad and Friends go directly to fund vocational training for children living in the slums of India. Please share this blog post with your family and friends to help grow awareness of Rita’s cause. You can also keep up to date with Rita’s stories and causes on her website and her new Facebook fan page, where you will also be updated about her plans for hosting a global 24-hour dinner party using recipes from her book. We’re all invited! 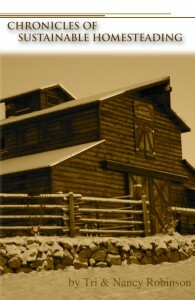 My friend Tri Robinson and his wife Nancy have just published a collection of their best blog articles from their Timber Butte Homestead website in their new book Chronicles of Sustainable Homesteading. My copy arrived in the mail today and it is my first read of 2010. In 1989, Tri and Nancy planted and continue to oversee the Vineyard Church in Boise, Idaho. Tri is also the author of four other books, including Saving God’s Green Earth: Rediscovering the Church’s Responsibility to Environmental Stewardship.